Due to the extremely bad weather conditions during the last few weeks the safety commission which is expected to give the green light to the French Alpine Club managing the hut will not be able to pay a visit to the new Goûter Hut at the planned date. The visit has been postponed no earlier than June 11 at best. 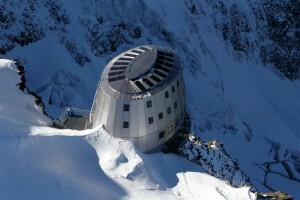 As a consequence the early birds going-up to the Mont-Blanc via the normal way and who already have made reservations, will have to be hosted in the old hut until the Alpine Club finally receives the approval to open it.